With Retron 5, you get a hardware that plays 9 different consoles out of the box: NES, Famicom, SNES, Super Famicom, Genesis, Mega Drive, Game Boy, Game Boy Color and Game Boy Advance. And with the Power Base/Master System-converter, you get Master System support too. Retron 5 is region free. No worries about PAL/NTSC. 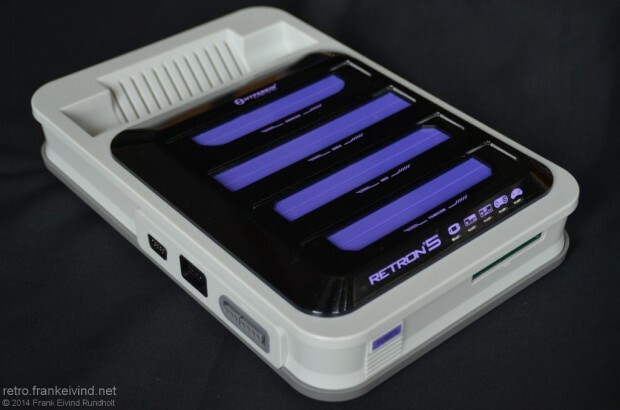 The multi-console Retron 5 from Hyperkin was supposed to come out last year. But after a lot of delays, it was released in the US in June 2014. It’s supposed to be out in Europe this September (but that may just slip). 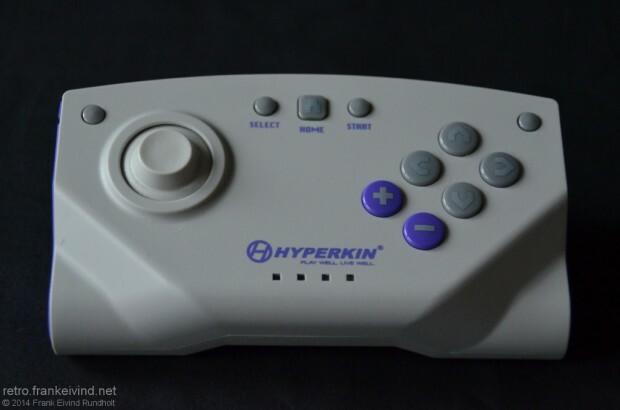 Hyperkin have been critized for their launch of the console. Physical stores got the console before online retailers. And people who had pre-ordered over a year ago, had to wait for ages to get their console. I might have had luck, since I pre-ordered in February and got my console mid-June. I bought it from Amazon.com [affiliate-link]. The retail price for the Retron 5 is $140, but 3rd parties easily sell for $100 more, so be aware. So on with the review of Retron 5. The review is done with system software v0.2.2 and Retron 5 application v1.4 (build 1496). This review was originaly written in Norwegian, so spellingmisstakes might happen. The console is big, but weight a lot less than expected. The are four slots for games on the top of the console. One for Sega Mega Drive/Genesis, NES, Super NES/Super Famicom and Famicom. In the front you got the slot for Game Boy/Game Boy Color/Game Boy Advance. The slots are pretty tight, so you might have to use force to get the game cartridges out. The easiest way is to pull the cartridges from one side only. On each side of the consoles, you have controller pors for NES, Mega Drive and SNES. At the back of the console, you find the HDMI-out (720p), micro-USB for charging the controller and an SD-slot for updates, screenshots and game-saves. The Retron 5 have an internal memory of 1.2 GB, which should be enought for most userer since the gamesaves doesn’t take that much space. 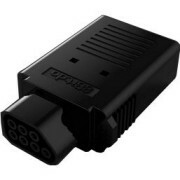 The console also comes with a multipoweradapter, which hade 4 different connections and support 100-240v. The console is regionfree and can play games from Europe, USA and Japan (which are the traditionally regions). At first, I didn’t like the controller that much. It’s to many stright lines. It should have look more like the Classic Controller for the Nintendo Wii. But I have get used to it by now. The most annoying part of the controller, is the clicking sound every time you press a button. I don’t like the joystick, it should have been a D-pad. And I think the controller is a bit to light. On the other hand, the controller have enought buttons. Two shoulder buttons, six jump/shoot [or what ever you call them]-buttons, Start and Select. The Home-button takes you to the In game-menu. It also have two small round buttons on the top of each side. You can add a function to thoose. I use them for snapshots (memory dump from the emulator) and screenshots. The controller are pre-configurated, but you can switch around the function of the buttons. The buttons on the NES, SNES and Mega Drive controller can also be mapped at your choice. If you want to play a mulitplayer game, you can mix and match any set of controllers. I had to try the Zapper, the lightgun for the NES. It was not a surprise that this didn’t work. I also tried the mouse that was included in Mario Paint on Super Nintendo, and it worked. When you plugged it in, you even get the mousepointer in the menus and can use it instead of a controller. Hyperkin is aiming for 100% compatibility for the Retron 5. That’s a high ambition for a hardware that imitates 10 different consoles. They do release firmware updates quite often, which is very good (can be downloaded here). They also release beta-firmware with upcomming improvements. With a few exeptions (which I will talk about down the page), every game I’ve tested have worked. That’s 88 games spilt thorugh: NES (13), Famicom (3), Super Nintendo/Famicom (12), Game Boy (11), Game Boy Color (5), Game Boy Advance (18), Mega Drive/Genesis (15) og Master System (16). I was wondering how the Retron 5 would tacle games with special chips which often have been problematic with emulator (at least in the past). I tested a couple of games on the SNES with the Super FX-chip. Starwing and Stunt Race FX both played fine. Sega also made a special chip, the SVP (Sega Virtua Processor). Because of the high price of the chip, only one game feature it. Virtua Racing did cost $100 at launch and plays fine on the Retron 5. The original Game Boy-games plays in black and white, exept for Pokemon Red and Blue, they are coloured. It wasn’t a big surprise the my two Game Boy Advance flashcarts didn’t work, since the Retron 5 doesn’t support them. But I had to try. I had a couple of unofficial games showing up as ‘unknown’, but the played fine. Nothing showes up when you put in a Game Boy Camera into the console, not even a ‘unknown’. I know you couldn’t take picture with it when inserted into the Retron 5, but it would be a great way to save you pictures taken with the Game Boy Camera. I’ve sendt a request to Hyperkin to support it. Some of the games showed ‘unknown’ when inserted, but worked on the next try. The connectors on the cartridges may be dirty, so cleaning it would be a good idea. We are talking about 20-30 year old games. And the electronic in the Retron 5 might be more sensitive than the original hardware. Duck Hunt loaded fine, but can’t be played since the Zapper is not supported. You have four choices in the mainmenu. Play lets you play the game, obviously. In the Game menu, you can use a pre-defined list of cheats for games. Not all games are supported, and you can’t add your own Action Replay/Game Genie-cheats. You can also copy gamesaves to and fram the carts/Retron 5. With Settings, you can change filters, scanlines, aspect ratio and refresh rate. There is audio enhancement, chance the region of the console emulatet and you can reconfigurate the controllers at your taste. When you press the Home-button while playing a game, you get the In-game menu. With this you can save and load games, change filters and take screenshots. I’m very happy about the Retron 5, well worth its money. I have experience a freeze or two, but that does also happen on original hardware. 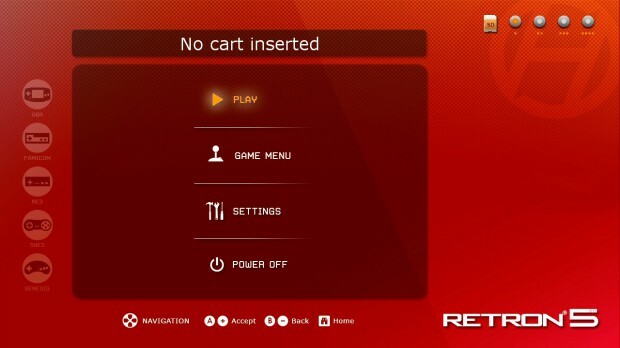 So why should you play games on Retron 5 instead of on original hardware? It’s very practical with one console instead of 10. It’s also easier to buy games on eBay or other auction sites. You don’t have to worry about PAL/NTSC-compatibility, since Retron 5 do play them both. It’s also great to have the save-feature for all games. If you only have 15 minutes to play, you can save and continue tomorrow. Some games do support saving on original hardware, but now every games does. And yes, an emulator on the PC does everything the Retron 5 does, but you have to download ROMs illegally from the net. And there is something about collecting games and use real cartridges when you play. Of course, the best way to play a game, is on its original hardware. But the Retron 5 is a good replaycement and well worth it’s $140. Please make a comment about your experience with the Retron 5 or if you have any questions. I’will try to answer them all. This entry was posted in console, Game Boy, Game Boy Color, Gameboy Advance, Hyperkin, Master System, Mega Drive/Genesis, NES, Nintendo, retro, RetroN 5, review, Sega, Super Nintendo/SNES and tagged console, Famicom, Game Boy, Game Boy Color, Gameboy Advance, Hyperkin, Master System, Mega Drive/Genesis, NES, Nintendo, retro, RetroN 5, review, Sega, Super Nintendo. Bookmark the permalink.